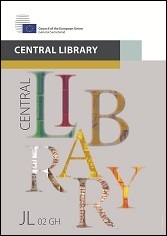 Here you will find an overview of the latest books acquired by the Central Library. The Central Library is open to all staff of the Council of the European Union and the European Council, trainees, Permanent Representations of Member States, staff of other EU Institutions and bodies, as well as (upon appointment) to researchers and students. Access to some physical Library holdings is restricted to consultation on-site.